Girls occupy a distinctive place in Japan’s mass media, including films and literature. What fascinates the Japanese is that the shojo nestle in a shallow lacuna between adulthood and childhood, power and powerlessness, awareness and innocence as well as masculinity and femininity. 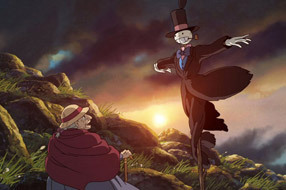 In Hayao Miyazaki’s Hauru no ugoku shiro (Howl’s Moving Castle, 2004), a wicked witch casts a spell on the demure young heroine that turns her into a wrinkled old crone. Sophie remains in this state for most of the movie, bemoaning the discomforts and difficulties of being old. Nevertheless, she is spirited away into the exciting realms of fantasyland, enjoying the companionship of a fleet-footed scarecrow, a cranky fire demon, a wilful wizard and his young apprentice. They spend a lot of time in the hero’s mobile home, a clumsy composite of natural and mechanical spare parts, powered by steam produced by the temperamental fire demon, Calcifer. Old Sophie offers to be the charlady who cleans up the mess made by the masculine inhabitants of the castle, but soon spearheads a crusade to stop the war that has erupted in the outside world. Displaying more initiative, courage and determination than her young male companions, she eventually succeeds in converting them to the cause, and cajoles them into overcoming their resistance to work and reluctance to act as a team in the service of a common goal. Of course, we know that the old lady is really a sweet young heroine (a shojo) in disguise and that, like all Miyazaki’s heroines, she combines conventional feminine characteristics with those of the conventional masculine hero. In the field of Japanese studies, the cult of the shojo has received a great deal of attention. 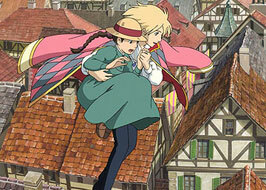 Most Miyazaki heroines are classical shojo in their age, cuteness, love of animals and pets, and sexual innocence. However, as Susan Napier argues, they are also endowed with the characteristics of the conventional masculine hero: they are active, assertive, adventurous and courageous. Some – notably Nausicaä and San – are crusading heroines, fighting the evils of environmental destruction, capitalism and militarism, supporting the victims of aggression and confronting the perpetrators. Howl’s is based on another foreign source: English fantasy writer Diana Wynne Jones’ eponymous story for older children, first published in 1986. Wynne Jones is not as well known as the author of the Harry Potter series but she covers similar territory: constructing complex narratives featuring numerous eccentric characters and full of witchcraft, wizardry and magic. 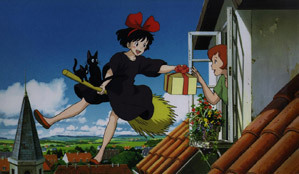 Other Ghibli studio productions that feature European settings are Rupan sensei: Kariosutoro no shiro (The Castle of Cagliostro, 1979), Majo no takkyûbin (Kiki’s Delivery Service, 1989) and Kurenai no buta (Porco Rosso, 1992). The heroine does not have magical powers but, like Chihiro, the heroine of Miyazaki’s previous hit, Sen to Chihiro no kamikakushi (Spirited Away, 2001), she has magical helpers (the fire demon, Calcifer, and the wizard Howl) and displays the true grit and determination as well as the caring qualities of the Miyazaki heroine. Like Chihiro and Kiki, she has to learn to overcome her fears and weaknesses. The cute æsthetic is apparent in the scene in Kaze no tani no Naushika (Nausicaä of the Valley of the Winds, 1984), when the determined and adventurous heroine is given her little pet and reverts to being a cute little girl (giggling, enthusing, behaving and looking childishly sweet); in the forest scenes in Mononoke-hime (Princess Mononoke, 1997), in which cute playful tree spirits incongruously appear; and in the cute dust mites (as well as Chihiro’s initially childish sulkiness) in Spirited Away. But San is not cute: she is wild and fearsome, the first close-up of her face smeared in blood. Ashikata is sweeter than her, and the principal figure of identification in Princess Mononoke. Here we see the intrusion of a political agenda in Miyazaki: the embracing of the cause of the Ainu, the indigenous people of Japan. Ashikata can function as the intermediary between the imperialist and capitalist Japanese and the non-human world because he belongs to a human tribe which reveres nature and believes in animistic gods. San refuses to accept her humanity and identifies only with the non-human world. In this film, Miyazaki creates awesome, even sublime, images of nature and the miraculous healing powers of the king of the forest. In Spirited Away, the cute is largely displaced by the grotesque: the heroine’s parents are transformed into enormous ugly pigs; the wicked witches, the twin sisters Yubaba and Zeniba, are grotesquely large and repulsive in appearance; Yubaba’s baby son is a ridiculous object of his mother’s doting affection, because he has such a bloated body and is so ugly; the stink god Okutaresama is gigantic and frighteningly repellent. These figures are all fearsomely ugly, grotesquely inflated in size and æsthetically repulsive. There are hints of the social criticism that is overt in Nausicaä and Princess Mononoke in Spirited Away – the conversion of the river god into a fearful stinking giant is presumably the result of water pollution; the parents’ transformation into pigs presumably punishment for their selfishness and greed – but these issues are not highlighted. The film remains a fantasy adventure, embracing strange and frightening experiences, friendly and hostile encounters, beauty and terror – gripping the viewer into the imaginary and unpredictable space of dreams and nightmares. Unlike Princess Mononoke, this film was expressly designed for an audience of ten-year-old girls and functions as a rites-of-passage film whereby the selfish, sulky, dependent and passive heroine learns to become socially skilled, self-confident, hard-working, active and enterprising, a survivor who – with the help of a few friends – also manages to free her parents from their bewitchment and enslavement. However, vestiges of the sublime æsthetic also survive in the film, in the muteness of the nature gods and spirits – the river god, Kaonashi and the Daikon spirit. The sublime is figured in suspension of sound and image – emptiness and silence – because it cannot be represented. (5) Appearances of the Lord of the Forest in Princess Mononoke are accompanied by suspension of sound and whitening of the screen. In these two late films, Miyazaki seems to move beyond the charming utopianism of his fantasy worlds towards an endorsement of Shintoism without its accompanying imperialism – in their reverence for animistic gods. Nature is not just beautiful, it is awesome, divine, even sublime. Perhaps because it is set in Europe, not in Japan, Howl’s Moving Castle includes scenes displaying the beauty of nature, but they tend to be picturesque views of landscape full of pretty, colourful flowers, rather than emanations of the sublime. However, the film does have a political dimension that its literary source lacks. The violence in Wynne Jones’ novel is wrought by the Witch of the Waste and there is no reference to war in the real world. Miyazaki’s film includes horrifying scenes of the damage caused by a real war and Sophie becomes an anti-war crusader, appealing to the king to stop the war rather than merely trying to perform a favour for Howl. It is hard to avoid reading this dramatic departure from the original as a specific reference to the Iraq war, if not a political statement. 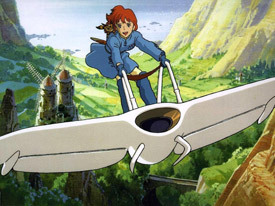 It is true that some of Miyazaki’s previous heroes (Nausicaä and Ashikata) tried to stop wars between opposing factions, acting as mediators and working hard to defuse the critical situation, so one could say that Miyazaki has always endorsed a pacifist position and deplores the destruction of life, property and natural resources that is the inevitable outcome of war. However, in the current international climate, he may well have had a more specific target in mind. Nausicaä and Ashikata are not just pacifists, however. They are also crusaders for the preservation of nature, fighters against the destruction and pollution of the natural environment. In interviews, Miyazaki has admitted that the Minamata case, involving mercury poisoning of the fish in Japanese seas as a result of industrial pollution, was in his mind when writing and drawing the Nausicaä story (initially as a manga series, before it was adapted to the screen). 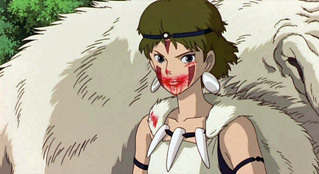 Princess Mononoke tackles several issues: in particular, the destruction of the natural environment through unchecked industrial growth; and the criminal disregard for the rights of certain classes of living beings (women, indigenous people, animals, forests) that accompanied the rise of capitalism and nationalism and militarism. The whole film seems to be questioning the directions taken by modern Japan, and bemoaning the losses. This is definitely Miyazaki’s most political film, but one that was less popular abroad than it was in Japan. In America and Australia, it seemed to have trouble finding an audience. It included scenes too disturbing and issues too complex for children; and yet its protagonists were too youthful and sexually innocent for adolescent and adult audiences. So, how does Miyazaki link the shojo figure with social criticism, environmentalism and reverence for nature? The shojo and kawaii (cute) culture are commonly associated with consumerism, with the regressive tendency to escape from social realities, at best with a passive resistance to social norms. By retaining the nurturing and caring attributes of femininity, but investing his shojo with active (masculine) characteristics, Miyazaki makes his shojo active supporters of the oppressed victims of greedy power-mongers, even crusaders for social reform, rather than self-absorbed narcissists. He thereby implies the need to combine the yin and the yang, the feminine and masculine, in order to achieve social justice as well as social harmony. Ashikata is another such case in reverse – of a shonen, a young masculine hero endowed with feminine sweetness and a caring attitude. Picking up on the conventional shojo’s fondness for cuddly animals and pets, Miyazaki extends this cute consumer cult to embrace a love of nature, even reverence for nature, by drawing on animistic aspects of indigenous religion (Shinto and Ainu beliefs). The cute æsthetic is employed in part, but alongside an æsthetic of the grotesque and the sublime. Finally, it must be said that, although Miyazaki’s heroines can be crusaders, they are not feminists. They do not display solidarity with other women or appear to care about the rights of women. They are placed in opposition to adult women figures (power-hungry aggressors, frightening witches), reversing the gender but following the common trope of sci-fi anime, in which male youths (shonen) successfully battle against corrupt power-crazed adult males. The issue is not gender (female versus male) but generation (youth versus age), producing a fantasy of empowerment for impotent youth. In fact, it is the aggressive Lady Eboshi in Princess Mononoke who is the patron of oppressed women, employing former prostitutes as industrial labourers and earning their gratitude. With the exception of Tonari no Totora (My Neighbour Totoro, 1988), the shojo heroine in Miyazaki is a single child, without girlfriends or sisters, and incipiently heterosexual. Diana Wynne Jones supplied Sophie with two younger sisters who are excised from Miyazaki’s version of Howl’s Moving Castle. San and Chihiro each have a special male friend, but the relationship is not allowed to develop into a full-blown love affair. The relationship is platonic, like a brother-sister relationship. Mothers are generally absent. However, powerful matriarchal figures replace the powerful patriarchal figures of most sci-fi anime and adult males are often figures of fun or ridicule. With his beautiful blue eyes, long lissom limbs, long blond locks and languid looks, Howl is an androgynous fantasy figure, a Prince Charming in the tradition of the heroes of the all-girls Takarazuka theatre revues and more especially of the manga genre of fairytale romances with European period settings that are so popular with teenage Japanese girls. With Howl, there are signs that Miyazaki is tiring of the shojo figure. Before her bewitchment, Sophie is a lonely young adult, a professional milliner, rather than a school-age girl. The wicked witch turns her into an aged crone; thereafter she spends a lot of time bemoaning the condition of old age that her creator is fast approaching. Since Princess Mononoke, Miyazaki has been constantly threatening to retire but he is still working. Currently he seems to be flirting with genre-blending as well as gender-bending. We await the next development in his career with interest. “A Cocooned Identity: Japanese Girl Films: Nobuhiko Oobayashi’s Chizuko’s Younger Sister and Jun Ishikawa’s Tsugumi”, Post Script 15, No. 1, Fall 1998, p. 35. Quoted by Susan Napier, Anime from Akira to Princess Mononoke (New York: Palgrave Press, 2001), p. 119. Napier, p. 118f; John Whittier Treat (Ed. ), Contemporary Japan and Popular Culture (Honolulu: University of Hawaii Press, 1996), pp. 281-7; Sharon Kinsella, “Cuties in Japan”, in Lise Skov and Brian Moeran (Eds), Women, Media and Consumption in Japan (Honolulu: University of Hawaii Press, 1995), passim but particularly 244; Ann Sherif, “Japanese Without Apology: Yoshimoto Banana and Healing”, in Stephen Snyder and Philip Gabriel (Eds), Oe and Beyond: Fiction and Contemporary Japan (Honolulu: University of Hawaii Press, 1999), pp. 282-3; Jennifer Robertson, Takarazuka: Sexual Politics and Popular Culture in Modern Japan (Berkeley and London: University of California Press, 1998), p. 158. Skov and Moeran, pp. 220-54. Helen McCarthy, Hayao Miyazaki: Master of Japanese Animation (Berkeley: Stone Bridge Press, 1999), pp. 218f. For further elaboration of the sublime, see my article, “Akira and the Post-Nuclear Sublime”, in Mick Broderick (Ed. ), Hibakusha Cinema (London: Kegan Paul International, 1996), particularly p. 95.